The ACCION for Rural West Texas serves residents of rural communities where high rates of CRC incidence are also prevalent. It is grant-funded by the Cancer Prevention & Research Institute of Texas. The overarching goal of this program is to lower the CRC morbidity and mortality rates in nine selected counties in the rural West Texas area. Counties served include: Crosby, Floyd, Garza, Hale, Hockley, Lamb, Lubbock, Lynn & Terry. ACCION for Rural West Texas provides no-cost CRC prevention services including education, FIT testing and colonoscopies, and patient navigation. They are at the Free Clinic Wednesday nights from 5pm to 7pm. USAccess connects free medicines and supplies to health care organizations that work with low-income populations in the United States. Their assistance with medication costs allows us to serve more people. The purpose of this organization shall be for the advancement of students interested in healthcare related fields by providing peer counseling in pre-health classes. The Dr. Bernard Harris Pre-Medical Society is dedicated to providing potential medical school applicants with up-to-date information regarding the medical school application process. In addition, they provide a unique Freshman Mentoring Program as well as unique healthcare exposure, volunteering opportunities, mock medical interviews, MCAT workshops, and much more. They are a source of help and information that will help students reach their career goals. Established in 2007 at TTUHSC, the Laura W. Bush Institute for Women’s Health focuses their efforts on diseases primarily found in women, specifically breast and ovarian cancers. They have developed a multi-campus across West Texas that develops research and educational programs to address issues found in rural populations. Lubbock Aid Ambulance has been serving the Lubbock community since 1968 and strives to provide the best possible care and service for its patients. 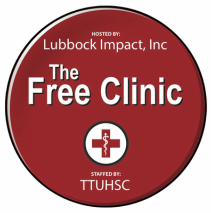 Lubbock Impact graciously provides their space and help with The Free Clinic building. They are constantly looking for new ways to improve the clinic and volunteers at Lubbock Impact positively effect the clinic flow each night. Lubbock Impact provides a free meal not only to patients, but to student volunteers as well. The clinic would not exist without their willingness to allocate space and time to our efforts. We truly could not function without their hard work and dedication each week. Mobile Medical Services offers the fastest, most reliable and accurate portable x-ray service to nursing homes, home health agencies, private businesses & correctional facilities. Its highly trained specialists and mobile diagnostic resources are fully committed to providing the highest quality care possible. Social workers faculty and students provide assistance in obtaining free meals, official identification cards, mailing addresses (for homeless) and LCMI assistance. Social work also increases awareness of Medicare and Blue Card benefits to eligible patients. They are critical in providing the best care for Free Clinic patients. Personal Finance Planning students organize and provide informational materials on personal finance topics. They also assist patients in filling out medication assistance forms and answer any tax and personal finance questions. UMC generously provides laboratory assistance with blood work, nursing and laboratory supplies, and pathology reports. Their assistance allows the clinic to provide free pap smears to women, as well as serves a crucial role in evaluating laboratory tests for our patients. Additionally, a large number of the nursing volunteers that work at the clinic each week are trained at UMC. The West Texas Area Health Education Center (AHEC) Program is a coordinated effort between the Texas Tech University Health Sciences Center (TTUHSC), health care providers, communities and counties across West Texas. The collaborative program focuses on developing the health care providers of the future as well as supporting current health professionals in West Texas. The mission of the West Texas Area Health Education Center (AHEC) is to address the health care provider shortage and improve health care access in West Texas through education and development of the health care workforce. The West Texas AHEC serves 105 counties in the western half of Texas. The service area has been divided into five AHEC regions covering the South Plains, Panhandle, West Central Texas, Permian Basin and far West Texas. Program services are carried out at the local and regional level through Area Health Education Centers (AHECs), which are hosted by local community organizations in partnership with Texas Tech University Health Sciences Center. One of the key components of Area Health Education Centers is that they are community-based to better meet the local health care education and health professional support needs. For more than 50 years, the YWCA of Lubbock has been a champion for women and families on the South Plains, setting the pace on critical issues that impact quality child development and family services. The YWCA of Lubbock serves the community needs and uses positive opportunities for fitness, fun, and family as a means to address our primary mission of empowering women and eliminating racism. YWCA programs sustain their core mission of supporting women as they take care of their families and address their own health, personal development, education, and career aspirations. Through a partnership with the YWCA, the clinic has been able to provide free mammograms for women throughout the year. This partnership has proven crucial for diagnosing abnormal cysts and breast cancer in women who would otherwise remain undiagnosed.